Sand blowing from the Mountain View Road solar facility. More Bad Decisions By A CSD! A study on the demise of Newberry Springs. Massive renewable energy solar projects are now being planned for the Silver Valley. The first two will take over 4,700-acres of Daggett and Newberry Springs. Many more projects that will blanket the Silver Valley are expected. The rural lifestyle and community of Newberry Springs will be decimated by the solar industrialization of the entire Silver Valley. Supervisors Bob Lovingood and James Ramos have paved the way for the industrialization of the Silver Valley by removing Policy 4.10 from the Renewable Energy and Conservation Element last August. The county Board of Supervisors ordered Policy 4.10 to be reviewed by the Planning Commission. The county's Land Use Services Department, under Terri Rahhal, Planning Director, has stalled that order for six months. It is reported that Terri Rahhal is not following the Supervisors orders at the August 8, 2017 Board of Supervisors meeting, but rewriting Policy 4.10 to favor the developers and writing additional versions so that "the Planning Commission has some options." Policy 4.10 was written after many months of negotiations with the public, why is Terri Rahhal so obstinate to weaken it? Why is she directing solar to the Silver Valley in violation of some of the county's solar siting guidelines? Are the orders coming from the Supervisors? Newberry Springs is not only fighting apparent corruption from the county but also from within. Newberry Springs has an uphill battle in fighting the solar invasion. Stopping the solar advancement can be done but the Newberry CSD (CSD) appears dumbfounded and confused about what to do. At the January 30, 2018, Special Board Meeting regarding solar called by the CSD Board, Ted Stimpfel of the Newberry Springs Community Alliance, who has some background experience regarding solar permitting in San Bernardino County, made a passionate plea that immediate action needs to be started to prepare for the CEQA Scoping and the presentation before the Planning Commission. This is a legal procedure and an Administrative Record should be properly prepared. Stimpfel warned that solar will kill the rural lifestyle of Newberry and that there will be an exodus of residents that will not be replaced. 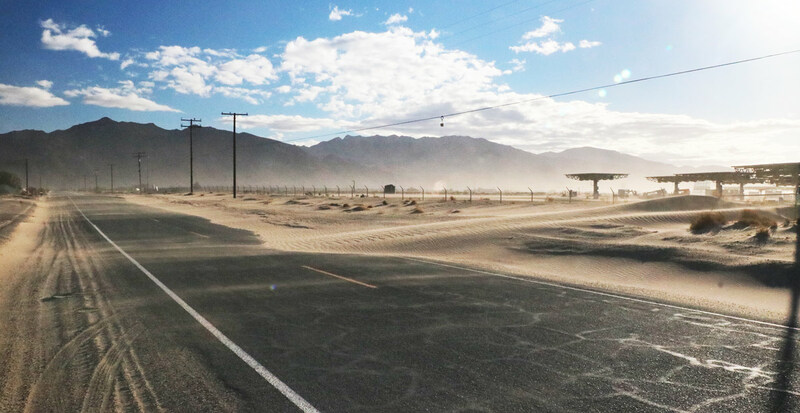 As the enrollment of the Newberry Springs Elementary School lowers, the school will have to close with the elementary school children being bused to Yermo. In time, churches will close and the tax based infrastructure will diminish. Newberry Springs is situated in a Sand Transport Path. Pictured above is Harvard Road. At the January 30th Special Meeting, the only voice supporting the solar onslaught was Director Larry Clark who opposed a letter of opposition to solar being sent by the Board to the county and other public officials. Clark operates a well drilling business that could benefit from the numerous wells that large solar farm developments require. Due to the appearance of a strong conflict-of-interest, Clark should have recused himself from the vote. Clark is not the only supporter of solar in the community. It can be expected that about a dozen-plus families with large alfalfa farms are proponents. With adjudication limiting more of their water each year, they have been looking for an exit strategy to leave the valley. All large alfalfa fields in the Silver Valley can be expected to be converted to solar. With the solar industrialization of Newberry Springs, the community's weak residential property values are expected to plummet. People's retirement nest egg will be damaged. Stimpfel feels that Newberry Springs has a chance to successfully defend against the solar development if the CSD acts decisively and releases the Kiewit Pacific Trust funds for that purpose. What is the Kiewit Pacific Trust Fund? 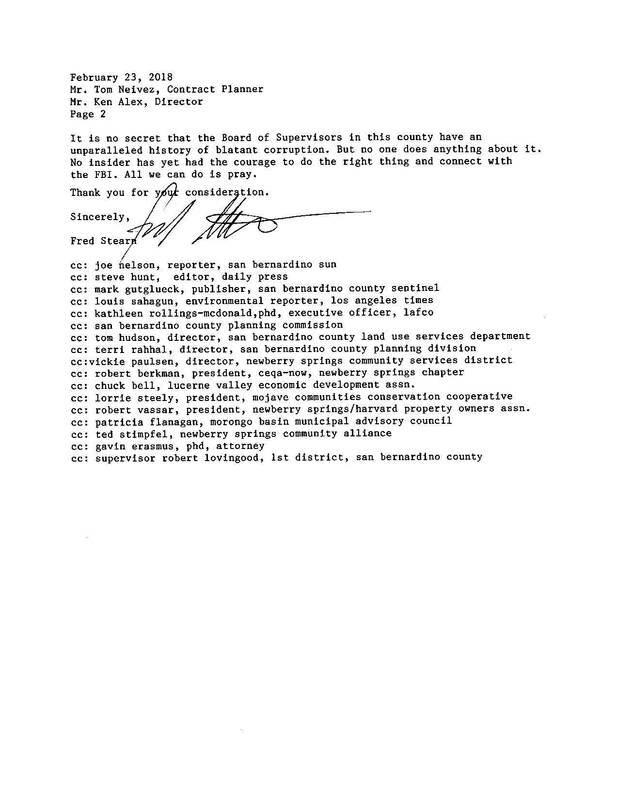 In 2004, in settlement of a clever Conditional Use Permit appeal (extortion plot) brought by CEQA-NOW, the Newberry CSD, and community individuals against Kiewit Pacific, the Appellants acquired a legal settlement of about one-million dollars in benefits for Newberry Springs. Included was $350,000 in cash. $20,000 was dedicated upfront by the settlement for the local fire department. By agreement between CEQA NOW, the CSD, and various individuals, the CSD was to manage the remaining funds on behalf of the Appellants for the benefit of the community. At the time of the settlement, there were multiple Appellants. The CSD was considered the best entity to discharge the Kiewit Pacific "donation" on behalf of the Appellants, so the CSD accepted the duty in a trustee relationship. The funds were to remain separate from the CSD's functions. Except for the upfront $20,000 to the fire department, the funds were not to be merged into the CSD's general fund that would have restricted the fund's usage to only those current functions authorized under LAFCO, those being the CSD's support of the fire department, parks and recreation, and street lighting. To assist the CSD in the discharge of the funds, on November 19, 2004, the CSD held a community workshop where 21 ideas for using the funds were developed. Thereafter, the CSD appointed Fred Stearn, Wes Sperry, Wayne Snively, and John Olson, to do a communitywide survey via the mail and compile the results for guidance in how the community funds should be used. The 21 ideas from the workshop were presented to the community to vote upon. The response was low but provided a cross-section of the community's desire. It is important to note that most of the CSD's suggestions in the survey have nothing to do with the CSD's LAFCO authorized functions. This further substantiates that the intent of the funds was not to be solely used for the purposes under which the CSD is authorized. Comingling of the settlement funds with the CSD's general fund is not something that CEQA NOW would have agreed to. It should be further noted that the Newberry CSD did very little in the Appeal, rather it was CEQA NOW and the other Appellants that originated and drove the Appeal on behalf of the community. It was felt that Kiewit Pacific's new mining operation owed some benefits to Newberry Springs. Instead of distributing the funds for the benefit of the community, the CSD has mostly sat on the funds for 14-years, with the CSD directors slowly evolving into the belief with passing time that the funds belong to the CSD solely for the CSD's limited functions as authorized by LAFCO. This kind of thinking is baloney! Only three authorized expenditures apparently have been made to distribute portions of the funds. Two to the fire department and one to the Senior Center. When totaled and subtracted from the $350,000, it is reported that there is money unaccounted for. The CSD may have illegally comingled the missing funds with other CSD expenditures or the money was stolen. At last report, only slightly over $138-thousand remain in the trust fund. That appears to represent well over $100-thousand missing from the trust! While it is believed that the CSD is not authorized by LAFCO to handle separate trust funds, the CSD was a party in the Appeal and the CSD did accept the role in the settlement to handle the distribution of the settlement funds on behalf of the other Appellants. This established a fiduciary trustee relationship. If there is unaccountable money missing, the CSD is responsible for replacing it. Regardless, the CSD's current management and Board have nothing to do with the chaos. They inherited the problem. Highest and Best Use of the funds. With the proposed incoming solar targeting the community and with residential property values expected to be nuked, Stimpfel has asked the CSD Board for the immediate release of the Kiewit Pacific funds for their highest and best use. That being for the defense and survival of Newberry Springs. Stimpfel says that the funds should be applied to the costs of developing the community's legal opposition action plan and the preparation of an Administrative Record ("The Cornerstone of Judicial Review"). He suggests that the CSD should allocate the funds to be administered by an appointed community committee, and that both the CSD and CEQA NOW should have representatives on the committee to supervise the work and the expenditures. is now damaging the community. Surprisingly, the Board has appeared to show an indifference to protecting Newberry. They seemingly want to hold onto the Kiewit Pacific money and allow the solar industry a minimum of opposition to Newberry. Director Clark's position can be understood, but why the other directors? Undoubtedly, Director Paula Deel would like to see the Kiewit Pacific funds eventually going to the Newberry Springs Economic Development Association (NSEDA) that she and her husband controls. Possibly to that endeavor, she was instrumental in bringing in Director Victoria Paulsen as an appointment to the CSD Board. Victoria Paulsen is listed as NSEDA's Secretary. Paulsen is a good friend of Deel and usually aligns her vote with Deel on the CSD Board. Deel also has a close friendship with another director and appears to be building a Board cartel. In short, the holding back of the Kiewit Pacific funds, which could be used to protect Newberry Springs, might be for selfish reasons. The public can draw their own conclusion but with Newberry Springs on the chopping block, why should the CSD be holding onto 14-year old funds that could help to protect the community? Stimpfel warns that time-is-of-the-essence! "We are now in a dire emergency," he says, "a tremendous amount of work needs to be done immediately if Newberry is to be saved." Letter writing is politically helpful but the Planning Commission is primarily a legal proceeding where letters don't matter much, according to Stimpfel. "Critical time has already been lost, and the CSD's Board doesn't appear capable of the immediate needed action." We greatly appreciate Sup. 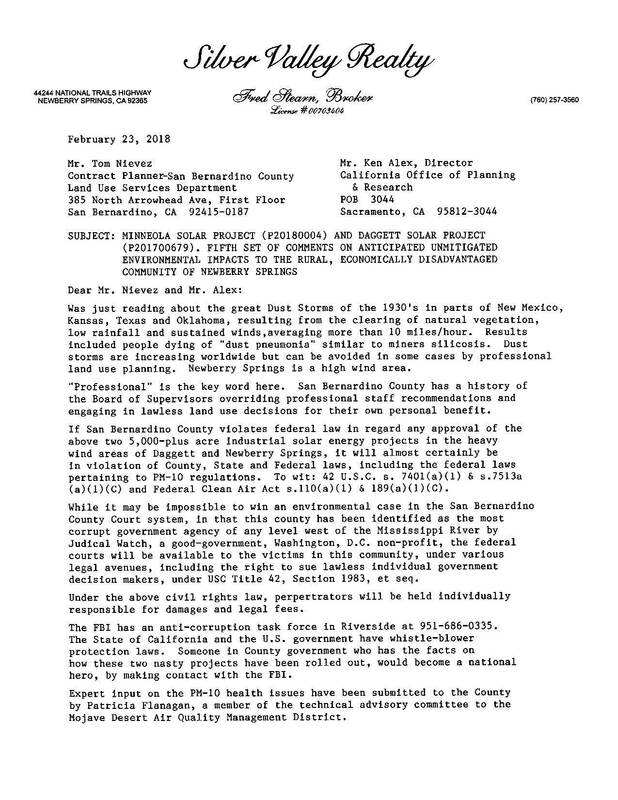 Ramos' and Lovingood's previous letter to BLM opposing North Peak Wind. And of course the BOS' denial related to the Soda Mt. solar project. Thus we are perplexed with mixed messages about the BOS'/County's position on RECE - particularly Section 4.10. It looks like 4.10 might not be going back to the PC/BOS as originally worded - or maybe as an option - but with a mix of options - focused on design and project configurations 'consistent/compatible with community standards and plans', etc. Planning has been 'working with developers' - so far not us. And the community plans used for 'consistency' determinations would be those in place at the time of project application acceptance - not the pending, updated community plans not yet approved. In 2007 no one had an inkling of industrial solar. The best attempts for consistency and compatibility that could be practically done won't likely work for us. Putting make-up on a porcupine doesn't mean we want to kiss it. So how do we deal with the 5000 plus acres of solar projects in LV - with their applications accepted as complete by the County? 4.10 specifically declared: No industrial scale solar projects in community plan areas' - not in Rural Living zoning - etc. That was our ace in the hole to keep them out of our communities - what we all wanted and asked for during the past 4 years. We thought the County did too with its recommendation for other sites in the County. But the BOS deleted that section - whether intentionally to provide time to allow these projects to be filed (that they must have known were in the offing) - that with 4.10 in place their applications wouldn't have been accepted let alone filed - or for some other reason that we aren't aware of. (We try not to be conspiracy theorists). BOS publically stated it wanted the PC to review 4.10 before the BOS acted on it - even though County Counsel supposedly told Planning its wording was consistent with the PC's intent. But if that was the case - and IF the BOS really wanted to keep these projects out of our communities - RECE's 4.10 would have gone back to the PC ASAP - and then immediately back to the BOS for action and likely approval. But that didn't happen and the long period since its deletion has allowed huge industrial-scale solar projects to be filed in LV/Daggett/Newberry Springs. There is a strong public effort to get the BOS to include the original 4.10 in RECE. It still needs to be done and fast - who knows what else is coming down the line - but unfortunately the barn door has been open too long - and the applications that have been accepted as complete will be processed and if approved - will be grandfathered from those 4.10 stipulations. Whatever the reason for deleting/continuing/prolonging 4.10 - the bottom line reality is that the County left us with the potential of significantly losing/diluting the essence of our community identities and land-use integrity. So what do we do now? Chuck Bell is realizing that the fish isn't smelling right. The rural communities are being played. Meanwhile, the fight for Newberry Springs is being lost today by the CSD Board who don't understand what is currently happening. As the Kiewit Pacific trust fund is outside of the LAFCO powers and do not involve taxpayer funds, the Newberry CSD Board can release the funds at any time without a formal notice. Will they quickly stand-up for Newberry? to the county's contracted solar planner.